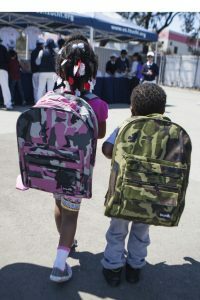 San Francisco, CA — To ensure local students start the academic year with the tools needed for success, the San Francisco Public Defender’s MAGIC programs will distribute backpacks stuffed with school supplies to more than 3,500 children and youth during two August events. More than 1,500 backpacks and school supply kits will be handed out to students from pre-K to college. Health care providers will offer vision and hearing screenings, glucose testing, and dental checkups; community based organizations will be available for families in need of resources and information. More than 80 community volunteers are expected to support the event. PG&E’s NOW Hunters Point Site – 155 Jennings St. This is the second year BMAGIC will be hosting at NOW Hunters Point, a project supported by Pacific Gas and Electric, NOW Hunters Point activates a portion of the former Hunters Point power plant site with short-term events and community serving programs as part of an innovative site maintenance and community engagement strategy. Approximately 2,000 elementary, middle school, and high school students will receive school uniforms and backpacks stuffed with school supplies. Students in K-8 must attend with parent or guardian. Free shuttle provided by Salvation Army will pick up attendees at four stops: Evans Street at Third Street; Evans Street at Middle Point; Huntersview at 1101 Fairfax Ave; and Youngblood Coleman Park on Hudson. Families can also look forward to a Kid Zone which will include Street Soccer USA, haircuts provided by New Generation Cuts and so much more. “The MAGIC back to school events not only provide San Francisco students with school supplies, they are critically important for families who want to connect with health, housing, and legal resources,” Adachi said. More than 100 community-based organizations working in the areas of health, environment, juvenile and social justice, faith-based and after-school programming will be represented at the events, along with elected officials, city agencies, local merchants, funders, grass roots activist, and organizers. Healthy food, sports, games and live entertainment will be provided. The events also serve to bring neighbors together, said BMAGIC Executive Director Lyslynn Lacoste. “BMAGIC and our network of partners look forward to this community building event and strive to improve the experience for our young people and their families as well ensure they are prepared and excited for the start of the new school year,” Lacoste said. Mo’ MAGIC event’s sponsors include Kaiser Permanente; the Office of Public Defender Jeff Adachi; the Department of Children, Youth & Their Families; Schools of the Sacred Heart; University of San Francisco; Sutter Health-CPMC; and the Bay Area Black Nurses Association. BMAGIC sponsors include the San Francisco 49ers Foundation; Golden State Warriors; California Pacific Medical Center, Comcast; San Francisco Credit Union; Union Bank Foundation, and Pacific Gas & Electric Company. Uniforms are donated by the Buddhist Tzu Chi Foundation.